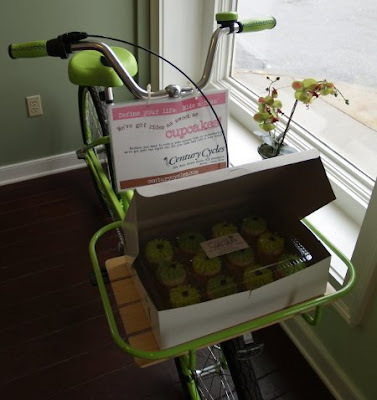 Century Cycles Blog: Century Cycles has bikes as sweet as cupcakes! 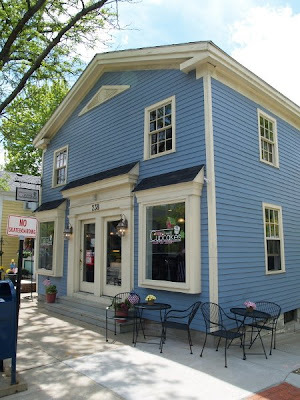 And Main Street Cupcakes has sweet treats to satisfy anybody after a good bike ride! 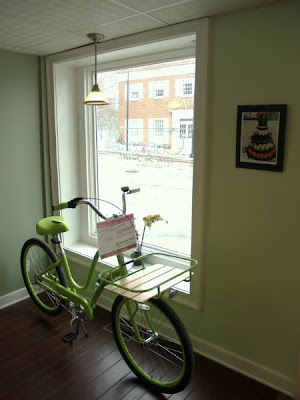 While you're enjoying your cupcakes, look for our Electra Townie Holiday 3 cruiser bike in Apple Green! It's perfect for cruising around town for errands, such as picking up some coffee, and of course, some cupcakes! It has 3 speeds and coaster brakes for simple operation, and it comes with the matching front basket! Matching some cupcake flavors to the Townie's Apple Green color was no problem for Main Street's Cupcake's creative baker. We can't match their variety of colors and flavors, although the Townie Holiday 3 also comes in Sky Blue and Khaki! Check back for a special offer for our rental bike customers to redeem this summer at Main Street Cupcakes! Exactly how much time did it take to match frosting to bike - color that is! Hmmm... that looks like a nice place to make a rest stop on one of my rides!! Especially after climbing Boston Mills Road east!